Objective: A subgroup analysis from the A1chieve study explored clinical outcomes in people with poorly-controlled type 2 diabetes (T2DM) changing from insulin glargine ± oral glucose-lowering drugs (OGLDs) to biphasic insulin aspart 30 ± OGLDs during routine clinical care. Methods: A1chieve was a 24-week, non-interventional study evaluating the safety and effectiveness of insulin analogs in people with T2DM (n=66,726) in routine clinical care in 28 countries across four continents. Results: Insulin dose increased by 64% in the 1395 people studied. Mean HbA1c at baseline was 9.7 % (SD 1.7 %) and reduced by 1.9 % (1.7 %) to 7.8 % (1.3 %) at 24 weeks. Other measures of glycemic control improved similarly, and 21.9% of patients achieved an HbA1c level <7.0 % compared to 3.3% at baseline, with reduced incidence of reported overall and major hypoglycemia (Table). 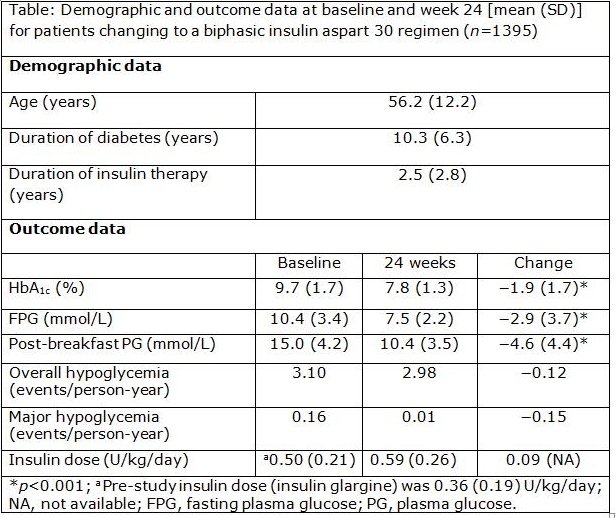 Conclusions: Changing from insulin glargine to biphasic insulin aspart 30 was associated with improvements in glycemic control, with reduced incidence of hypoglycemia and particularly notable improvements in postprandial glucose levels.